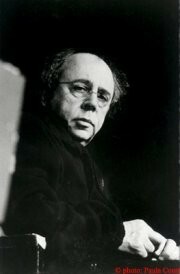 Legendary US theatre practitioner Richard Foreman is coming to the Nuffield Theatre to reflect on his artistic ideas and craft. He will be interviewed by Ola Johansson (Theatre Studies, Lancaster Institute for the Contemporary Arts). This is a unique opportunity to see, listen and talk with one of the leading avant-garde performance artists. Clips of some his most important works from 1976-2005 in his New York based Ontological-Hysteric Theatre will be shown and discussed during the talk. There will also be a generous Q&A session with the audience.